Stoncica Bay: This is one of the few sandy beaches in Croatia and it's also flat and surprisingly, not filled with rocks. This may seem like no big deal, but in Croatia, this is actually very rare. Relax in the calm water and sprawl out on the soft sand before you head to our next pit stop. 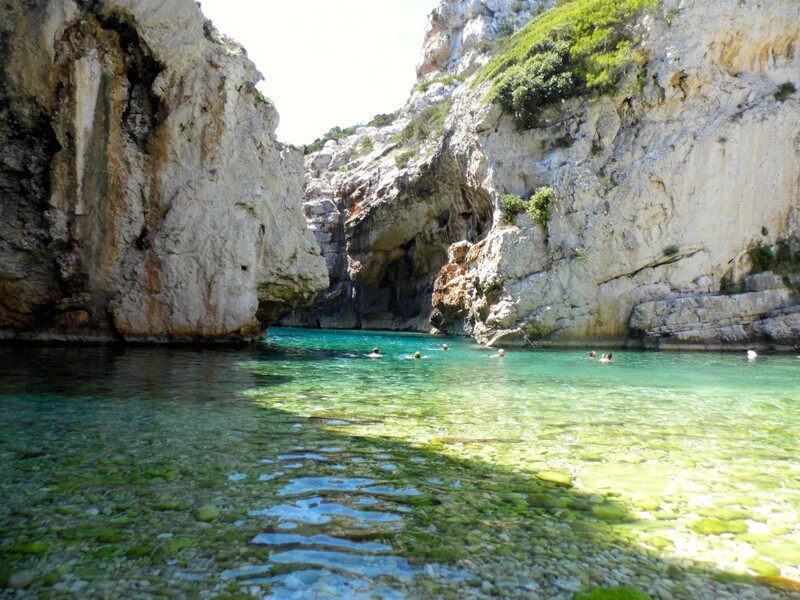 Stiniva Bay: The next place you'll want to go to is Stiniva Bay and the earlier you get there, the better. Why? Because tour boats arrive numerous times throughout the day to show tourists this natural wonder. This stunning spot is the definition of the art of nature but it isn't exactly "easy" to get there without a tour boat. When you park your car at the top, you'll notice that you're very high up from he beach. Try not to panic though! Despite how daunting it may look, the steep, rocky path that snakes down to sea level is manageable if you conquer it slowly. We promise that every step will be worth it when you get to the bottom. Vino: Even though there is a fairly good chance that you'll drink tons of beer while you're in Croatia, you should also take the time to try some of their wine. On your way back to Vis, keep your eyes peeled for a vineyard that sells wine (look for a sign that says "Vino"). Not surprisingly, this will not be the kind of vineyard that you can find in the Napa Valley in California or the Okanagan in Canada. Instead, it will likely be a small room inside someone's home where they make their own homemade wine and prošek (sweet dessert wine) that you can purchase for a very decent price. They'll invite you in to sit down and try a few samples, then you'll let them know what you decide to buy. It may not be the highest quality wine you'll ever taste, but it will be an experience nonetheless. 1. You won't find any hostels on Vis, so find a cute Air BnB and immerse yourself in Croatian culture by staying in someone's home. 2. When renting a car, keep in mind that most vehicles (if not all) will have standard transmission. If you cannot drive standard--and I do not recommend trying it for the first time here--then you should consider spending a bit more money to rent an automatic car. These are hard to find, but not impossible; ask around to figure out which company offers them. 3. Wear sturdy closed toe shoes for the journey down to Stiniva Bay and be careful not to overpack; carrying all your gear won't be easy!